The updates also include an "oopsey!" on my part - sometime in the delay of receiving Jeffrey Brodersen's email with information about his 1974 Raleigh singlespeed project and actually getting it posted to the Gallery, his description got separated from his images, and I'm left with no way to contact him to ask for his text again. So, Jeffrey, if you are reading this, zap me an email with the specifics and I'll get it updated. Cool ride, by the way. 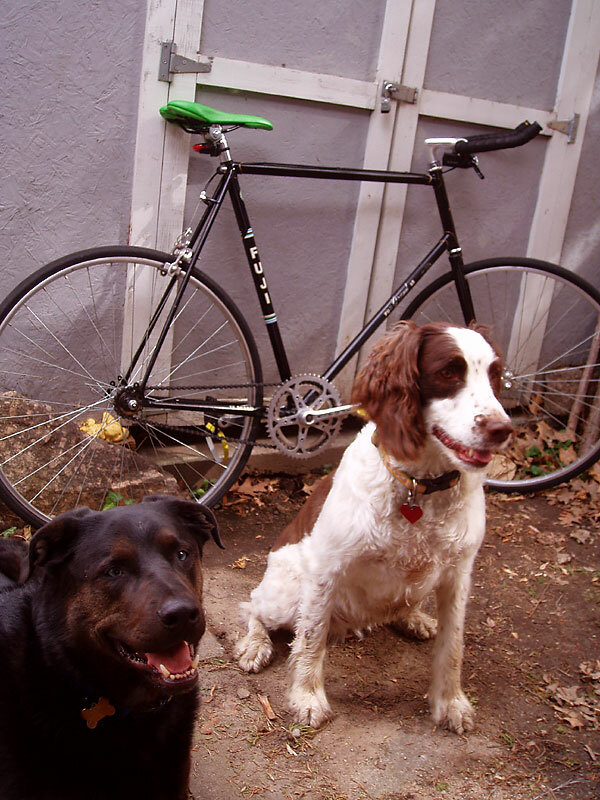 There's been a dearth of dog-buddy pix in submissions recently, and they are always appreciated when included. There's a simplicity about this build which is fairly deceptive, but captures a great deal of the allure of this type of bicycle. A bike with a single gear setup, whether fixed or coastable, has stripped away the confusion of extra cables and wiring, the complexity of on-the-fly gear choice and now reminds us of that easy and direct act of getting on and going. 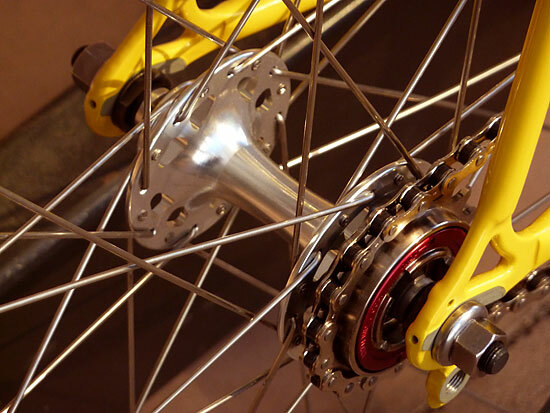 The high flange hubs are gorgeous, the newly updated powder coat smooth and creamy, but below it all lies the promise of the bicycle - easy and simple freedom. *A quick word about "Updates" - these have been languishing significantly, and honestly, they are a little cantankerous in terms of the workflow. I'm making a concerted effort to include a couple with each update now, so if you sent in new images of your existing entry, hang in there! Also, if you are sending in an update - please reference the Gallery # of your original in the email - that will save me a bit of time and make it more likely to see the updated version more quickly.